Summary: Allen Crags is located on a ridge of high ground that extends north-east from Esk Hause and is often overlooked by walkers heading to the Scafell range. Wainwright’s original listings included this fell with the 1 inch O.S. map depicting the height as 2572′ whereas the equivalent Bartholomew maps gave the height as 2512′ (this may have been due to human error- mistaking a figure 1 for a figure 7). The fell is bounded by Grains Gill to the west and the Langstrath valley to the east. 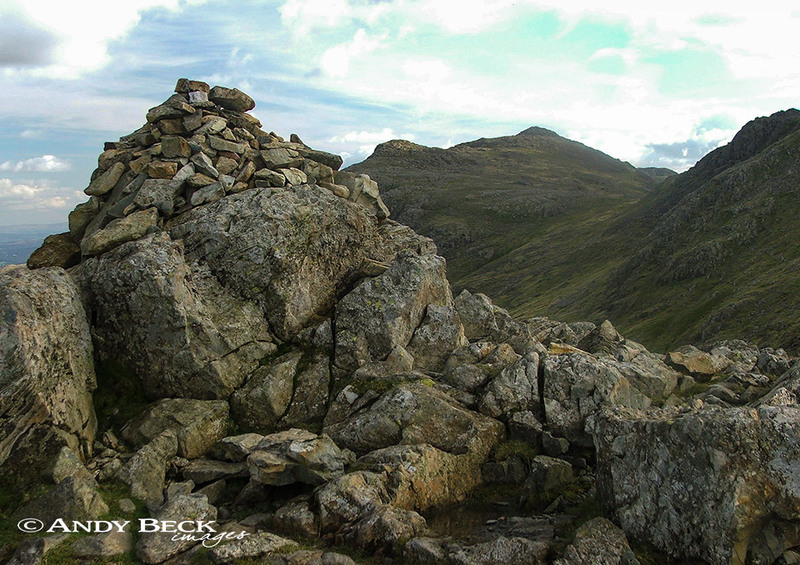 The ridge to the north extends to Glaramara and Rosthwaite Fell (Bessyboot). The terrain is a mixture of exposed rock and scree breaking through short cropped grass. Routes of ascent for walkers are rather limited, either a short walk from Esk Hause or along the undulating ridge from Glaramara, both are relatively easy. It would be very unusual to visit Allen Crags as a single goal for a walk, it is normally visited whilst on route to another fell or location. Topographical details: The height of 2572′ given by AW has been recalculated as 2575′ 785m and the summit is marked by a cairn on a rock platform at GR: NY23671 08527 which is the Wainwright summit. There is another rock platform with a small cairn just 10m to the north but this is lower. Points of interest: There are no mines or quarries in the area, points of interest come from natural features such as the ravine of Ruddy Gill and the numerous tarns dotted on the high ground of the ridge. Views are limited to the south but to the north they are impressive, especailly of the Borrowdale area and to the eastern and far eastern fells. Tarns: There are several small unnamed pools to the west of the summit but the tarns more worthy of a visit lie north along the ridge, there you will find Lingcomb Tarns and High House Tarn but just to the south of those is the unnamed tarn illustrated by AW on the Allen Crags 7 page, it is a real gem. 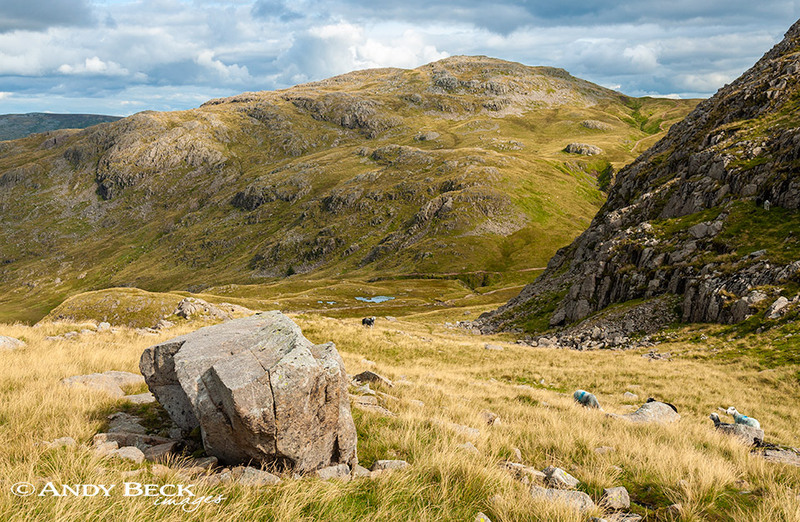 Adjoining fells: Glaramara is reached by following the ridge northwards. Nearest facilities: Car parking, there is limited parking (free) in Seathwaite along the roadside but do not obstruct farm or emergency vehicle traffic. Be warned, the parking area here can get very busy, so get there either very early or late in the afternoon. There used to be parking in a field near Seathwaite farm for a small fee but this has now been stopped. The nearest food, drink and accomodation can be found at The Glaramara House Hotel. Star rating: (2.3 / 5) Allen Crags lacks interesting routes of ascent or dramatic scenery only the views and pleasant tarns give it merit.